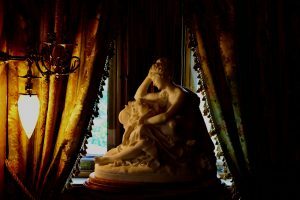 RVA Mag set off one downcast Sunday in June to uncover the mysteries of Swannanoa, the Afton, Virginia mountain palace of the famous Dooley family. Before reaching Swannanoa, I was almost certain that Dee Dee, the attendant at the Waynesboro Shell Station, would be the last person to see us alive. Waynesboro, Virginia is a small town in the valley of the Blue Ridge Mountains–a bleak, rural sprawl fringed by sloping foothills and rolling farmland. At first glance, this part of Virginia appears innocuous. It’s known for little more than its proximity to the Shenandoah National Park along with a litany of recent drug busts. However, there is a history of the bizarre nestled in these mountains. Sitting on top of one such mountain is the mysterious mansion built by one of Richmond’s most historic families, and the first stop in a summer of paranormal investigations undertaken by RVA Mag throughout the Commonwealth. 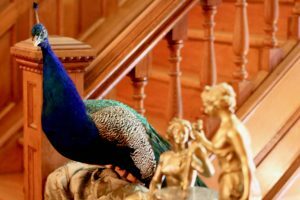 Before taking the winding road up to Swannanoa, we talked with Dee Dee about the rumors surrounding the mansion. A Waynesboro native, she alluded to the fact that something strange goes on at the top of the mountain; she has heard the rumors her entire life. She refuses to even visit the marble mansion that overlooks Rockfish Gap. We don’t have the same concerns. Swannanoa Palace is an iconic fixture of Afton – a once lavish estate built from blocks of Carrara marble – complete with terraced English gardens, intricate wooden paneling, a Persian tower, and enormous installations of Tiffany stained glass, some of the most coveted in the US. 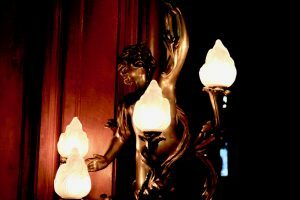 The palace’s renown is rivaled only by the rumors surrounding it–a cocktail of urban legends and local mythos that range from ghost sightings to the occult. Swannanoa was constructed as a summer home in 1912 by railroad magnate James H. Dooley, the same millionaire who built Maymont Mansion–the gilded age estate which sits in Maymont Park. And like Maymont Mansion, it was built for his wife, Sallie May Dooley, who remained childless, eventually dying at the estate in 1926. 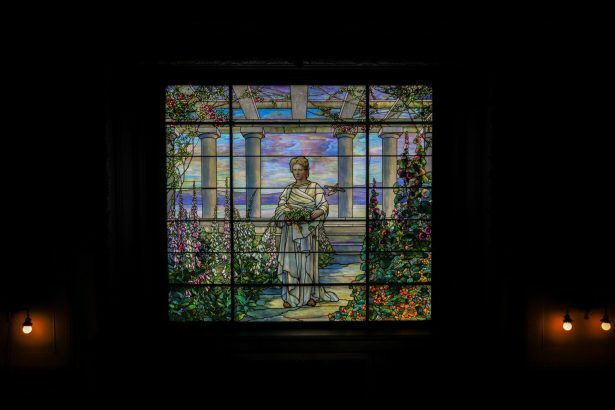 Upon entering the dilapidated mansion at Swannanoa, the first thing you see is an enormous stained glass window of Sallie May, which dominates the cavernous foyer and sits atop a grand staircase. Before taking an ad-hoc tour of Swannanoa, I check in with our team. Everyone is already scattered around the mansion; we’re a B-list Scooby Doo remake, minus the dog. By the end of our “investigation”, I am hoping to unmask at least one wealthy landowner in a ghost costume. 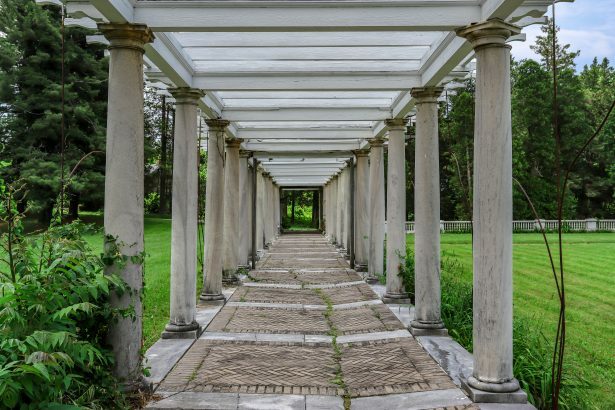 The tour is given by Airisun Wonderli, an Augusta County native and author of Swannanoa Palace: A Pictorial History—Its Past and People, who recently moved onto the Swannanoa grounds. Wonderli is not only a historian of Swannanoa, but a member of the University of Science and Philosophy (USP), a spiritual group dedicated to the teachings of its creators. The University was founded at Swannanoa in 1948 by Walter and Lao Russell, who leased the mansion for 50 years. Walter was a philosopher, author, and artist, who Wonderli claims Walter Cronkite called the “Leonardo Da Vinci of our time” when he died in 1963. Lao was a self-made woman from England, a former model and businesswoman, who shared Walter’s visions of grandeur and his unique cosmogony. Despite the thirty years that separated them in age, Wonderli called their relationship “one of the greatest love stories that has ever happened.” Walter and Lao’s journey to find Swannanoa was “prewritten”, according to Wonderli, a key mechanism in a larger design, part of the destiny they spent their lives trying to fulfill. Matt Presti, the current president of USP, agreed that there is something special about the top of the mountain where Swannanoa sits. I’ve heard people say it’s a vortex, but for me the experience of being at a higher elevation with a view,” Presti said. “It’s more about the inspiration you receive from such natural places of power. To Wonderli, USP’s following is no surprise, claiming that Swannanoa has a magnetic draw. This is true for students of the philosophy like Adrianne Boyer, who was working the information table when we arrived. Boyer is a new convert, whose family left Texas to be closer to the University where her husband works as a scientist out of a “laboratory” in his basement. They are living on the mansion’s property now, and the same land where the Russells were buried after their death, or their “refolding,” as it is referred to by USP. Even though time has forced the gaudy Italian Renaissance revival architecture into crumbling disrepair, the mansion is still striking. It towers over the front drive, a jagged alabaster tomb, its heavy wooden doors giving no hint at what lies inside. A majority of the house is sealed away, but we were allowed to wander downstairs. The grand marble staircase curves to the second floor, where only one bedroom is open. It overlooks the wooded grounds, teasing a glimpse at the vast mountain valley that brought Lao and Walter to the estate 70 years ago. 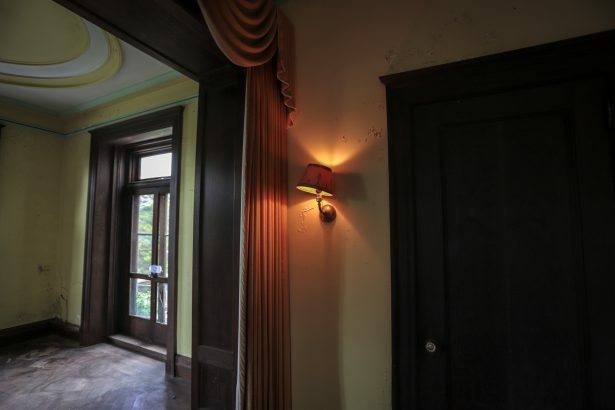 While some of the mansion’s rooms are closed to the public, a look through any keyhole reveals piles of clutter. Wonderli said there are some rooms she has never been in. Other volunteers said no one has stepped foot in the basement in years, part of the house lost to rot and disuse. 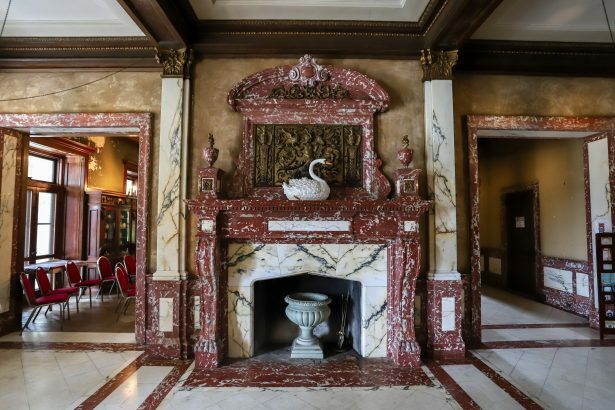 The current owners, James and Sandi Dulaney, who keep the house open for tours, have spent millions attempting to repair the mansion, yet it has proved too much to maintain. 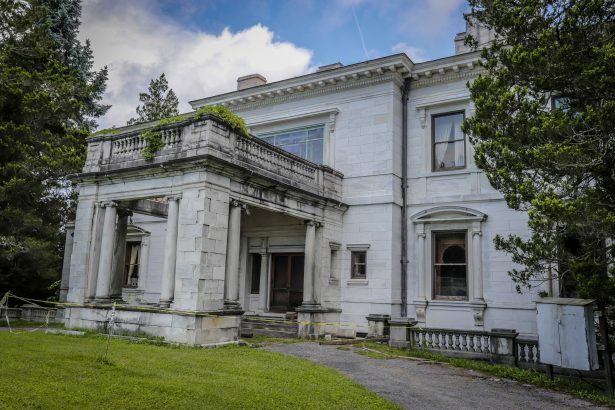 Dulaney is also the owner of Afton Inn, a “blighted landscape” that mars the mountainside just below the palace, another project that has fallen into disrepair. The deteriorating interior adds to the atmospheric small-town-lore for which house has become notorious. 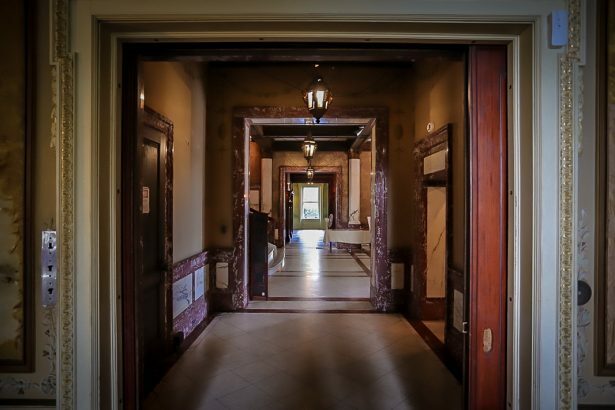 Hauntingly beautiful (despite cracked marble verandas), Latin inscribed wooden molding, and a mirrored elevator tucked behind what looked to be a hidden wall panel, the drop would be fatal if it caught you unawares. The grounds are equally corroding, the marble exterior falling from the stairs that lead to a sparse landscape, a large, jagged crack running the length of the columned, italianate portico. 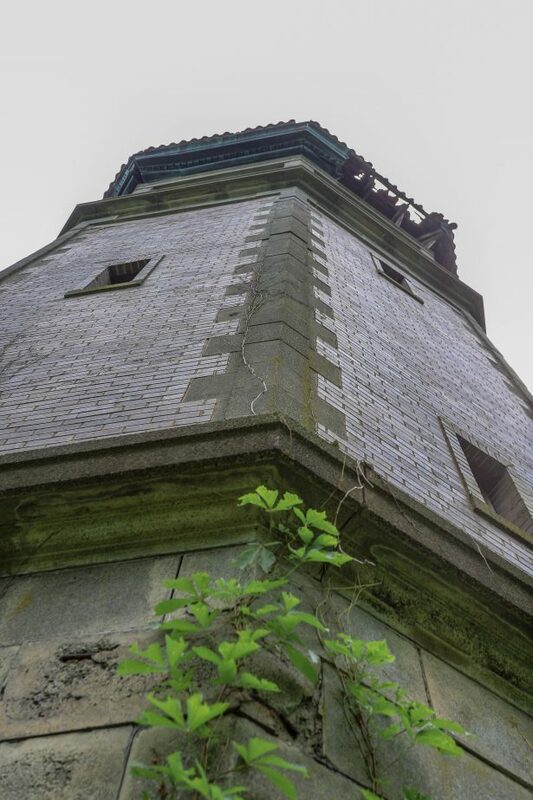 There’s a tower growing out of the ivy on the back acreage of the property and, in true Shaggy fashion, my ill-advised exploration inside almost led to a plunge through a gap in the winding, rotting stairs to the dark basement below. Zoinks. Wonderli said she has felt spirits at the house, though not malevolent. “That trauma gets caught,” Wonderli said of the Native American slaughter she assumes once happened on the land. She claims to have heard noises, or sensed a presence. Afton locals, Lyle and Tonna Lotts, have conducted paranormal investigations in the area since 2011 with their team The Twisted Paranormal Society (TPS). They were more than eager to conduct an exploration of the mansion in 2013. They said it was their most followed investigation by the Afton and Waynesboro community, and even though the Dulaneys did not let TPS do a full shut in or spend the night, they were allowed a few hours on the property until midnight. 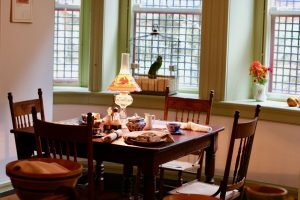 While they would have liked more time in the house to conduct a more thorough investigation, they found enough to be convinced of Swannanoa’s haunting. They used video and audio equipment and K-II meters – a standard paranormal investigation tool that responds to EMF fluctuations – but much of the evidence could be heard without any electronic assistance. Tonna recounts hearing footsteps while in one of the towers, and the sound of approaching feet when looking around the corner. They also heard an audible moan in the library in response to a question they asked of the purported spirit. Lyle believes some of the spirits came from the “second generation of the house,” The Russells and USP, which he referred to as a cult. “There’s a basement there as well that we never even got to go into. And, of course, the tower that’s in the back,” said Lyle. Double zoinks. Alongside the ghost stories, Swannanoa is home to some more fringe conspiracy theories. Among them involved the yearly homecomings of The Center of One Heart, an offshoot of USP that was created in 2000. Some members, like Wonderli and Boyer, are still a part of both organizations. The homecomings were designed to be yearly retreats back to the mansion, even being held by Lao when she was alive. Airisun called it a gathering, a festival of sorts, where speakers from the group are invited to lecture. A 2015 post on The Center of One Heart website, called “The Electrifying Power of Male-Female Balance,” goes into detail about the meaning of their Homecoming that year. “All are welcome to celebrate at the altar of the swan and to enjoy the magic and pure consciousness of a sacred site and vortex which will be magically re-opened again,” wrote One Heart member Devi Herrsche. There are also plenty of rumors tying the Illuminati to Swannanoa, and a man who lived on the property next door, William Bennet Edwards, was known for spreading sensationalized stories about the mansion. 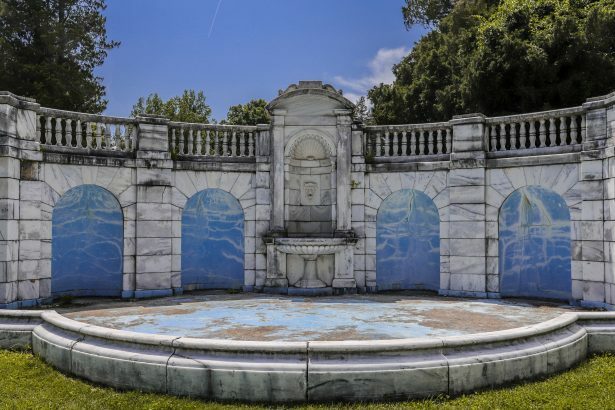 Vortexes, celebrity sightings, and the Illuminati aside, Swannanoa Mansion has a presence that keeps the space alive, even as the marble facade begins to crumble. 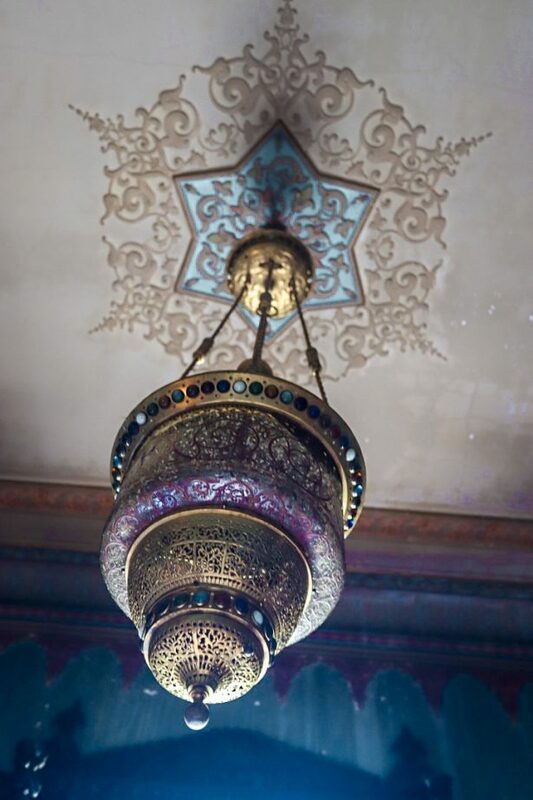 There is a throughline of spirituality, beauty, and mystery that runs beneath the palace, and you don’t have to look much further than a simple visit to decide for yourself. But if you ask me, I still think there’s something in the basement. Rolling hills and a sprawling park lead to the beautiful mansion that sits on a hill. 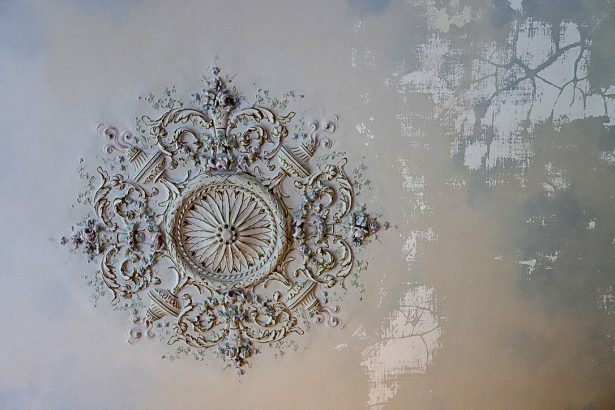 Its detailed architecture and lavish decor are frozen in time as the legacy of the mansion in Maymont has been sealed into its bygone generation, waiting to reveal its ever-present charm of the Gilded Age to the 21st century. If you grew up in Richmond, then at some point you have been on a school field trip to Maymont. The farm animals and seemingly endless bamboo forest make it the perfect playground for an elementary school child, and years later you might return to have a picnic or two on its sprawling lawns. However, it’s unlikely you have walked through the doors of the residence which once belonged to the family who began it. RVA Magazine had the privilege of receiving a private tour of the Maymont mansion with Curator and Director of Historical Collections and Programs, Dale Wheary, to learn about its past, its construction, and to understand how the mansion functioned as the living, breathing home of Mr. and Mrs. James H. Dooley. Maymont was open to the public only six months after Sallie Dooley’s death in 1925, but very few first-hand accounts survive from the Dooley’s themselves. All of the Dooley’s papers, records of sale and personal documents were destroyed after her death as a customary means to protect the privacy of the deceased, meaning much of the history we know about the mansion today was collected from first-hand accounts, newspaper clips, and family members. Luckily, these various means to information have painted a relatively clear picture of life in the Dooley house, even over 90 years later. 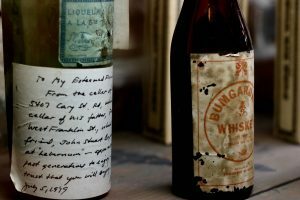 John and Sarah Dooley came to America from Ireland, and like most immigrants of their time, hoped to make a prosperous life in their new country. After marrying in Alexandria, the couple moved to Richmond and John Dooley set up a hat shop on Main Street. A charismatic, philanthropic man from a prominent Roman Catholic family, Dooley quickly entered the elite social circles of Richmond and his hat business flourished, selling them throughout the South and amply providing for his wife and nine children. After the war, James Dooley finished his graduate degree and became an attorney, doing quite well despite the economic challenges in post-Civil War South. Unfortunately, his father’s hat company burned down during Richmond’s evacuation fire. Although John Sr. wanted to rebuild it, he was getting old and simply couldn’t restore it. John Henry met his wife, Sallie May, and they were married in 1869. As the young Dooley began to accumulate his own wealth, he began investing in a number of different railroad companies and was on the board for several of those companies, which included Richmond & Danville and Chesapeake & Ohio, now CSX. By the 1880s, Dooley’s railroad and real estate investments did so well he decided to discontinue practicing law and dedicate himself to business. He and his wife began running in the same social circle as Lewis Ginter and Joseph Bryan, doing business with Bryan and Fred Scott. They traveled frequently and would sometimes take horseback rides through the counties outside the City of Richmond. It was on one of these rides in 1886 that they found a beautiful plot of land in what was then still Henrico county–a lovely hillside from which you could see the James River. “He said they had set out from Shields Grove, riding down the hill, across the creek, up the hill, and came to this spot, the highest place on the property, the old oak trees, the beautiful views of the river, and they decided to buy the property and build their estate here,” said Wheary. At the time, many members of the upper class were moving to the outskirts of cities to escape the congested streets and smog of a lately industrialized city. The area had been farmland during the 19th century and was complete with ravines, creeks, hills, lowlands and a beautiful landscape that led to the ornate estate. In 1887 the Dooley’s hired Edgerton Rogers, an American architect who had grown up in Rome, Italy and had been hired by Lewis Ginter the same year. The house was excavated in 1889 and at 13,000 square feet, it was finally finished in 1893. It became their private park and was one of the first electric houses in the country. The Gilded Age, a period from the 1870s until WWI, was a short period in the American South that boasted economic growth whose style coincided with the Victorian era in England. 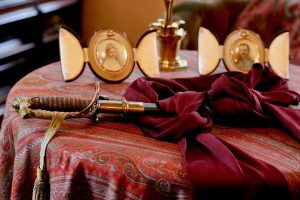 Dooley was one of the Gilded Age millionaires, which showed in the style of the house, the objects that furnished it, and the staff they hired at Maymont, a name he chose taken from Sallie’s maiden name, May. Since the house was built nearly 40 years after the Civil War, no slaves were part of the construction of that house. They did hire an army of groundskeepers and gardeners: about 20 men who worked on the grounds, plus an estate manager who lived in a cottage at the Hampton Street entrance with his wife, and about 10 staff that worked in the house. Although the Dooleys had no children, they were often surrounded by nieces, nephews, and of course their employees, with whom they developed close relationships. While the grounds of Maymont are lovely, everything inside the house is beautifully ornate, every detail is perfectly preserved and plays out like a film. The dining room is posed for dinner, as if at any moment the Dooleys will sit down as their butler, Mr. Dilworth, rings the service bell, signifying to the kitchen that dinner may be served. Maybe their Saint Bernard would come running through the room as the fireplace crackled in the front hall, and the maids finished up their workday. The Dooley mansion is truly frozen in time. The collection Mrs. Dooley left after her death totaled about 1,000 pieces. One of the remarkable pieces in their collection is a set of china plates, originally created for President Rutherford B. Hayes to sit in the White House. Because the project went over-budget, the White House permitted the company to make duplicate sets. There are only a few in the world, and the Dooleys managed to acquire one. It’s one of the largest collections of this particular sets in the United States. Upstairs, the Dooley’s bedrooms further reveal their excess wealth. Mrs. Dooley’s bedroom is a vision of white and blue, with paintings and figurines of swans throughout the room. 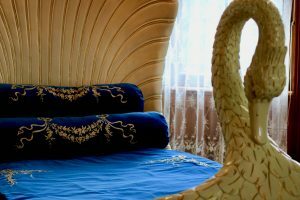 In the corner stands a magnificent swan bed, complete with her original mattress, which was brought from her summer home. 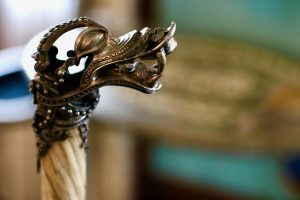 Her vanity set, also original, was made by Tiffany and Co. and is made from sterling silver and narwhal tusks. Inspired by Viking ships excavated in 1903, Vikings were a popular theme at the time, and Tiffany created a ‘Viking revival’ line of houseware. At least twice, the Dooleys held large parties with over 400 guests crowding into the house. For these events, they hired caterers out of Washington. However, on a normal day, Mr. Dilworth was the master and commander of every meal. Well-versed in proper dining etiquette and order of courses, he oversaw their dining experience as well as every aspect of the house. William Dilworth, a black man, worked in the house as the head butler, a role which meant he was effectively head of staff. In addition to Dilworth, the Dooleys hired an assistant butler, cook, assistant cook, maids, and a laundress, among others. 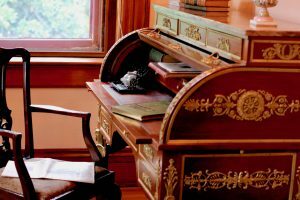 Much of the information Maymont curators have gathered about the domestic workers of the Dooley household is from descendants of the employees themselves, including the cook, Frances Twiggs Walker. The heart of the mansion is in the basement. Refurbished to show what life would have been like for Maymont’s staff, the basement is also frozen in time to reveal a full, working kitchen, pantry space, servers’ quarters, and even bedrooms for the few staff who lived in the house. A house like Maymont was a desired place of work for those in domestic service: the staff was large so less work needed to be done, the family was wealthy but small, and the pay was good. Mrs. Walker’s kitchen has a gas stove, a large table for chopping and rolling, and of course a talking parrot. Walker, a black woman, had many children who inherited her profession and would go on to work as head cooks at Maymont themselves. People like the Dooleys did their best to look out for their staff, such as providing health care in a government that did not yet provide welfare and a country that did not offer equal rights to all its citizens. However, working in domestic service meant spending a great deal of time away from your own family while you catered to another’s. Although Major and Mrs. Dooley were kind, political ideology at the time was split many different ways and likely caused some interesting conversations at the dinner table. Major Dooley died in 1922, and in his will suggested to his wife she leave the estate to the City of Richmond to become a museum and park. Sallie died in 1925, at 85. She willed a great deal of her money to various charities and institutions around Richmond, including $500,000 to build the Richmond Public Library, as well as leaving generous gifts to each of her house staff. The domestic workers received between $500 to $1,000 in Mrs. Dooley’s will. Frances Twiggs Walker was able to buy a home with the money. Unfortunately, this left no money to the city to maintain Maymont, thus the Maymont Foundation was created. It took only six months to open the property to the public. Mr. Dooley in his will expressed their desire that the city keep Mr. Taliaferro as the groundskeeper, a request which they granted. He remained in his cottage home at the Hampton Street entrance until his death in the 1940s. 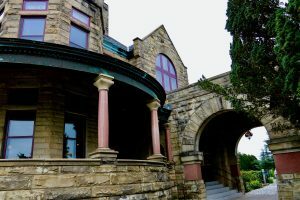 However, in 1975, the Maymont Foundation took on the monstrous responsibility of raising the funds needed to maintain the property, operating as a separate non-profit to run the park and museum, which now costs $11,000 per day, or $3.3 million per year. 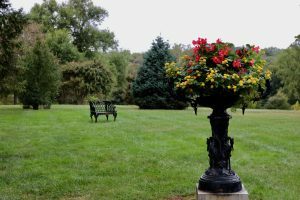 Since then, the Foundation was able to refurbish the house, keep the grounds, and add well-loved Maymont spots we know today, such as the Nature Center and the Maymont Farm. Yet the shining jewel of the grounds is still the Dooley mansion, steeped in history, its halls ringing with the clang of Ms. Walker’s pots, Mr. Dilworth’s footsteps across the carpeted floors, laughter of nieces and nephews come to visit, all overlooking the lawn and gardens of Maymont Park which now host Richmond’s picnics, weddings and school field trips alike. And to think it all began with a hat shop. The Richmond Jazz Festival recently announced its musical lineup for 2017 and it is stacked with amazing musicians and bands for its eighth season. R&B/soul queen herself Erykah Badu will headline, along with Common (with the Richmond Symphony), The Isley Brothers, Jazmine Sullivan, The Manhattan Transfer and Bob James who round out the other big name acts. The rest of the lineup includes Pat Metheny,Peabo Bryson, Harvey Mason, TajMo: The Taj Mahal and Keb’ Mo’ Band, BJ The Chicago Kid, Melanie Fiona, David Benoit, Joey DeFrancesco + The People, Jane Bunnett and Maqueque, Marcus Miller, Dave Koz with Larry Graham, Robert Cray, Norman Brown, Elle Varner, Butterscotch, Joey Alexander, Juan de Marcos and The Afro-Cuban All Stars and Maysa. The Richmond Jazz Festival will take place Aug. 10–13, with performances at the Virginia Museum of Fine Arts, the Hippodrome Theater and Hardywood Park Brewery. On Saturday and Sunday, the festival with culminate at Maymont. This year, the festival will introduce CaRue, a prelude to the festival that features free, live performances by local and regional artists around Carytown, such as the Byrd Theatre. In addition to live jazz, the festival will feature free wine tastings by Ste. Michelle Wine Estates, chef demonstrations, artist meet-and-greets and over 30 regional food and merchandise vendors. 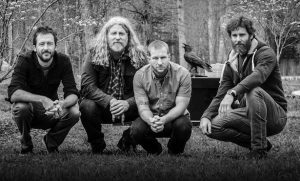 Admission is free for the performances at Hardywood and the Jazz Café at VMFA on Thursday, August 10 and $30, not including fees, for “Homegrown at the Hipp” at the Hippodrome Theater on Friday, August 11. 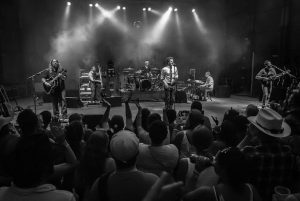 Early bird single-day passes for the festival on Saturday and Sunday, Aug. 12 and Aug. 13 are $75, not including fees and early bird weekend passes are $140, not including fees. Early bird passes will be available May 25 through July 6. Tickets can also be purchased at the gates, but are subject to a rate increase. Check out the festival website for more details. Get your tickets here.